Tupperware is keen on coining new names for its products. I have a soft spot for the Eleganzia range, which I always say in RuPaul's voice, but the Bake 2 Basics range is one pun too many for me. And there is a lot of 'n': Grab'n'Cut (scissors), Heat'n'Serve (microwave dish), and Sip'n'Care (baby's cup). I also like the idea of naming the product in a way that suggests it is not just passively storing your food, but actively taking care of it. Doing the job so you don't have to. So your cake is not in a tin, but in the Cake Taker; and your sandwich is not in a box but in the Sandwich Keeper. The Sandwich Keeper is a very humble product, almost the cheapest thing in the catalogue. It is the product I recommend to party guests who don't really want to buy anything, but who don't want to be impolite to the hostess. It feels like a classic, hence its inclusion here, but that's maybe because there is something a bit old school and retro about a sandwich made with sliced bread. You certainly wouldn't get a baguette, roll, or doorstep butty in there. Don't underestimate the Sandwich Keeper. It is beautifully designed. There is no seal to store (or lose), because it is attached, which is a blessing. 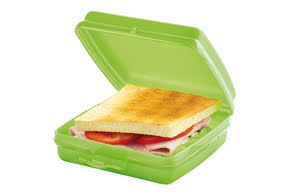 The Sandwich Keeper's compactness, slim with the rounded edges, is very pleasing on the eye and in the hand. It is a minor feat of engineering too, with what Tupperware grandly calls a "living hinge", all moulded from one piece of plastic. There are no separate pieces to fall apart, get lost, or harbour crumbs or germs. The clasp is also integral, and will not pop open when carried. A nice feature is that it is designed with a proper top and bottom. The bottom has four little feet that keep it slightly raised above the counter top to avoid scratches. According to my product guide from Tupperware HQ, the sandwich icon etched on the top of the Keeper adds "a touch of humour", which even I admit might be pushing it a bit. The Sandwich Keeper currently comes in the same colours as the Sports Bottle, and customers do indeed tend to buy them together for children's school lunches, no doubt packed in smart West London kitchens. On my consultant order form, intriguingly the colours are marked "Boy" and "Girl". At first glance in the catalogue, you would say "Green" and "Pink" -- but hold your horses, and look closer. In a camp flourish worthy of Eleganzia herself, the choice of colours is actually a manly "Tang" or a womanly "Fuchsia".